The lawsuit begins as the creditor or collection company will file the complaint or petition in court. The complaint includes the reason why the creditor(s) is suing you, what he wants from you, which usually is the money you owe him plus interest, and sometimes, you also have to pay the legal fees. The creditor(s) or his lawyer must serve or give you the copy of the complaint with the summons, which notifies you that he is suing you. The “summon’ also contain additional important information, like when should you file for a formal response in court. You have to sign and return the copy of the complaint and the “summon” to consider you “served.” It usually is a good idea to sign and return it, because if not, you may have to pay legal fees. The creditor can sue you in a state civil court, such as the municipal court, justice court, superior court, country court and more. If your creditor is the federal government, then the lawsuit will be filed in the federal court. There are states that let the creditors file the lawsuit in the small claims court, but the amount they are asking for should not be more than a certain amount. Usually, the money that creditors will collect will not exceed more than $10,000 in order to file the case in the small claims court. 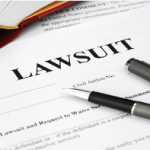 Usually, it takes only 20 to 30 days before you file a response to the lawsuit filed against you. Your written respond to the lawsuit is called the “answer.” There are fees to pay when filing a response. If you can’t pay for it, approach the court of clerk and find out if you can get a fee waiver. If you don’t respond, the court will reach a default judgement, where the creditor’s request will be granted, as long as it is reasonable. Going to default judgement is good, as long as you don’t have any defense against the creditor, or claims against him. To make sure what the best move is, it is always better to consult a lawyer.